The Astrid User Days 2012, held recently in Belgium, was a great opportunity for the GESAB Group to meet AEG TRANZCOM, who invited a delegation from GESABS Export Department. It is an approach to combine efforts in the security sector in Europe, where GESAB is developing various projects. GESAB has already earned the trust of experts in control rooms and high performance products for security, thanks to facilities like the control rooms in Mecca (Saudi Arabia), G4S in Belgium or ADT in Madrid, among others. This event is part of GESABs business and marketing strategy, which determines the presence of the company in all the major international events, related to the business areas in which the company is a reference: conceptualization and design of control centers, council rooms, multimedia rooms and data processing centers. 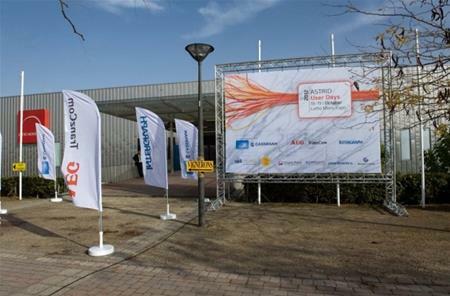 Astrid User Days is held every year at the Lotto Mons Expo exhibition center, 60 kilometers away from Brussels, which has an area of 8,800 square meters to house more than 60 exhibitors and about 1500 visitors. Police, firefighters, civil defense and all kinds of emergency services members of the old continent meet in one of the most important security fairs worldwide. This was its fifth edition, where visitors could enjoy a full program of workshops and conferences, hosted by the continents most respected professionals. The latest applications for communications security TETRA were the protagonists in all sessions.